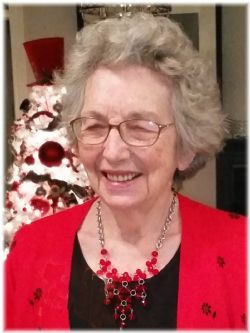 Betty June Mantooth, 93 of Paris, Arkansas passed away on Friday, April 12, 2019 in Dardanelle, Arkansas. She was born on November 28, 1925 in Wynnewood, Oklahoma. She was a homemaker and member of the Roseville Baptist Church. She is preceded in death by her mother Anna (Crawford) Love; her husband, Thad Mantooth; her son, Don Mantooth and her brother Louis Dillier. She is survived by one daughter, Tish Fowler of New Blaine; three sons, Ted Mantooth of Bentonville, Tim Mantooth of Raleigh, North Carolina, Mike Mantooth of China; 15 grandchildren; 15 great-grandchildren and one great-great grandchild. Visitation will be held from 5:00-700 p.m., on Wednesday, April 17, 2019 at Roller Funeral Home Chapel in Paris. Funeral service will be held at 2:00 p.m., on Thursday, April 18, 2019 at Roseville Baptist Church with burial to follow in Carpenter Cemetery under the direction of Roller Funeral Home in Paris. Click Play below to view the Video Memorial for Betty June Mantooth.